The Paint Bullet spray gun is made up of a powerful pump that sends the paint to the spray unit and converts it into spray. Can be used on large surfaces, corners, and tight spots. 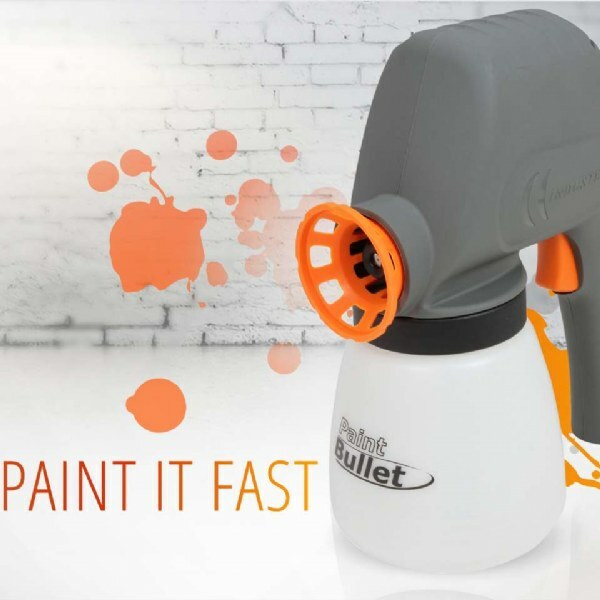 The Paint Bullet is made up of a powerful pump that sends the paint to the spray unit and converts it into spray. When you press the trigger, the paint is gently sprayed so it covers fast with a uniform coat of paint. Forget about brushes and rollers - the electrical Paint Bullet paints easy, fast and clean! Just fill the tank with paint, turn the Paint Bullet on and go! With the help of the practical spraying pistol you can quickly and comfortably make decorations or renovations in- and outdoors! Especially for bigger areas and areas that are hard to reach the painting is much easier and faster with the paint sprayer than with a brush. The result is a professional and even surface. No dropping, no stripes, no running! Additionally you safe costs as the Paint Bullet does not use more paint than necessary!